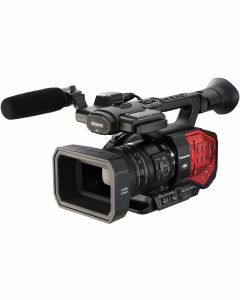 The Panasonic AG-DVX200 is the first Four Thirds type 4K/60p professional camcorder to feature an integrated zoom lens. The camera also features V-Log L, full HD OLED viewfinder and slow motion and macro modes. Just like its innovative forebear the AG-DVX100, the latest AG-DVX200 premiers as the industry’s first 4/3-type large format, 4K/60p camcorder to offer an assimilated zoom lens. The DVX200 records striking imagery by thanks to its Leica Dicomar 4K 13x zoom lens, amalgamated with a cutting-edge large format 4K imager and the combining of aesthetics like shallow focus, attractive Bokeh, and a brilliant 12 stop dynamic range supported by the VariCam style V-Log L processing. The AG-DVX200’s freshly designed lens-integrated body delivers superb mobility and additional versatility is offered by the compartment with hatch-type cover, shielding the battery and terminals from dust and impacts. The crimson red colouring and slick carbon-black textured body symbolises the thinking and developed features of the new AG-DVX200 which provide moving and precisely detailed 4K images.